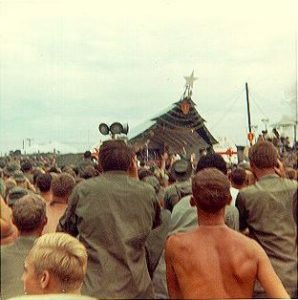 I took this shot while attending the Bob Hope Christmas show at Cu Chi, 1969. The Cu Chi base camp was quite large and there were probably several thousand GI’s present for the show, most from the field. The stage in the picture was about 50 yards from our headquarters battery, so we got good parking. The traffic was terrible but I think everyone arrived and departed safely. We were incredibly fortunate to be able to drive in from the field for the show. And we even made it back to our field camp before dark without incident.